Having originally evolved from a marine environment, the human body has a craving for marine based nutrients. Whilst it is common knowledge that we must include marine based Omega-3 Essential Fatty Acids in our diet for optimum health, the role that salt plays in our health is largely misunderstood and quickly demonised as being unhealthy. This common held belief is to the contrary, and, in fact, adequate salt-to-water ratio is critical to homeostasis and our metabolic health. Human plasma contains 0.9% sodium chloride, most of it coming from food and a small amount from water. As with everything biological, there is an ideal range and a sliding scale of severity in changes and the associated symptom. So, whilst we are concerned here with ensuring nobody suffers with a severe situation like hyponatraemia (low sodium levels), at Tribal there is also a desire for us to strive for our upgraded self and finding our bodies perfect, optimum health and high performance sweet spot. Our hydration recommendation is based on your weight, 0.033 litres of water per kg of your bodyweight (2.65 litres for an 80kg person) + approx. 250ml for each 20 minutes of sweat producing movement. If we consistently drink this amount with no thought for salt intake we can risk shifting the quantity of sodium chloride in our blood, quick note, tap and bottled water contains little to no salt concentration and can by measured by it’s dry residue value. Along with our hydration target, our foundation salt intake target is 1.5 teaspoons (8 grams) of salt per day as the basic human requirement. Surprised? Did you know until the end of World War 2 we where still consuming, on average 3.3 teaspoons a day (16-17grams). The 1.5 teaspoons is actually a minimum requirement, not a high recommendation. To attain this salt target, as well as salting your food, you can drink your salt by adding a salt to your daily water intake. Nobody wants a drink that tastes like seawater; play with the quantity so you don’t offend your palette. We encourage an ancestrally inspired diet full of real food that you can trace the provenance of. It is the same with your salt choice, in recent times, the most commonly consumed salt is a dry, finely milled, pure white salt that has been treated and refined to within an inch of its life, all that’s left is neat Sodium Chloride, this is not how we have evolved to consume our salt and we implore you to avoid this type of salt as much as you can, you’ll find this highly processed salt in all processed foods, in fast food and on your dinner table in shakers. 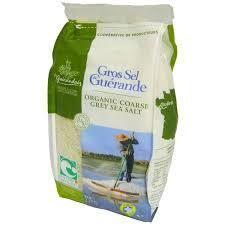 By no means is this the only healthful salt on the planet, but, the salt we recommend is a natural coarse grey sea salt from the west coast of France called Gros Sel Guerande, because of its complex, untreated and additive free nature, this choice of salt is way more bioavailable and beneficial to our health, along with Sodium, it contains Magnesium, Calcium and Iron along with 80 other trace minerals and its damp and grey, a good sign that it hasn’t been treated with bleaches and anti-caking agents. 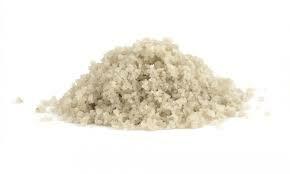 Just to be clear, here is the salt caveat, our recommendation of 1.5 teaspoons is not for neat white table salt, and, if you are still pursuing a diet rich in convenience foods, sports drinks, ready meals, processed meats, shop bought sauces and eating out regularly. Do not add additional salt to your diet. The brain is our central governor. The central governor is concerned with us maintaining homeostasis (biological balance) for survival, during extreme training and competition we are putting our body into a stressed state, to maintain balance our bodies are working really hard, through greater responsibility and greater perception we should learn to recognise the early signs that maybe we are losing this fine balance, failure to manage our blood sugars, hydration, heart rate, temperature and circulation will lead to a catastrophic drop-off in performance via a number of different mechanisms. What has this got to do with salt? Have you ever lay in bed after a hard day of training with energy legs? Have you found yourself feeling jittery with an elevated or palpitating heart rate? Do you ever feel the effects of low blood pressure; an example would be standing up quickly and feeling yourself spinning out? Do you suffer from regular cramping? These are all tip offs that you’re hydration, your plasma: sodium ratio or your magnesium intake is off and it needs addressing. Since the 1950’s we have been determined to drive our salt intake as low as possible, in fact, our salt intakes are now half of what they where at the end of World War 2 despite the common belief being that our salt intake is increasing year on year. In hospital, when it’s not possible to consume anything orally, a saline IV solution is administered to ensure optimum hydration levels are maintained or regained. On average a hospital IV solution provides 3 litres a day of a 0.9% sodium chloride solution each day, that’s 4.5 teaspoons of salt per day, not including any salt that can be taken with food. Why would a hospital be giving 24g of salt per day if it were detrimental to your blood pressure or your health? We LOVE Salt, use it wisely as part of our real food diet and It is life giving rather than detrimental to our health or performance. As with all things Tribal, the advice is to try it and see. Follow your instincts, heighten your perception and react to the tip offs that crop up to guide your future behaviours and decisions.